PHOENIX – At the end of a season that began with so much hope for improvement, the Phoenix Suns find themselves in virtually the same place they were a year earlier. And they face many of the same organizational questions entering this offseason that they faced when they wound up last season. “Personally, I’m not really pleased or satisfied with our season,” said coach Igor Kokoskov, who just completed his first season with a 19-63 record, worst in the NBA’s Western Conference. 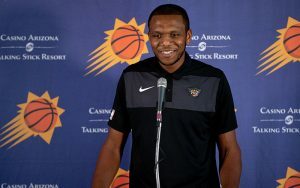 It is a long way from being the league’s most improved team, which is what then-General Manager Ryan McDonough said was the club’s aim when the Suns held their annual media day before training camp began. McDonough didn’t even make it to the team’s season opener before he was fired. And the Suns never obtained an experienced point guard to run the team. After six months and with 24 players appearing on the team’s active roster over 82 games, the Suns finished with the second-worst record in the league and two fewer wins than they totaled in 2017-18, when their 21-61 mark was the worst in the NBA. And for the ninth consecutive season, the Suns are going on early vacations instead of taking part in the NBA playoffs. Only the Sacramento Kings, who haven’t reached the playoffs in 13 seasons, have a longer postseason drought than the Suns. What those steps will be remains unclear. Booker is the leader of the team and he’s only 22. Twelve players on the Suns roster are 26 or younger and started games this season. McDonough and key members of the basketball operations staff were fired nine days before the season opener and James Jones and Trevor Bukstein have shared general manager duties since then. With Kokoskov, a long-time NBA assistant, in his first as head coach and newly acquired veterans such as Trevor Ariza and Ryan Anderson joining young players like Booker and Josh Jackson, No. 1 overall draft pick Deandre Ayton and No. 10 pick Mikal Bridges, the Suns opened the season with an impressive home victory against the Dallas Mavericks. The excitement was short-lived in a season that saw the Suns struggle through a franchise-record 17-game losing streak. Because of injuries and roster turnover, not one player who started that season opener against the Mavericks was in the starting lineup when the Suns ended the season in Dallas. Injuries and inexperience took a toll on the team, and their difficulties persisted as the Suns finished with their worst record since their inaugural season in 1968-69, when they won 16 games as an expansion team. The plan of adding experienced players to a young core backfired quickly and led to a wave of roster upheaval. The Suns bought out the contract of veteran big man Tyson Chandler, traded Anderson for combo-guard Tyler Johnson and found themselves in a three-team trade debacle with the Memphis Grizzlies and Washington Wizards, which fell apart amid confusion over which player with the last name “Brooks” – MarShon or Dillon – that the Grizzlies intended to include in the trade. Eventually, the Suns dealt directly with the Wizards to send Ariza to Washington for Kelly Oubre Jr. and Austin Rivers. The Suns waived Rivers, who made it known that he did not want to play in Phoenix. The mix-up was emblematic of larger organizational issues that have plagued the Suns, but Oubre turned out to be one of the highlights of the team’s season before he suffered a ligament tear in his left thumb that ended his season. ESPN’s Adrian Wojnarowski reported that the Suns are close to hiring former Detroit Pistons and New Orleans Pelicans general manager Jeff Bower to a high-ranking front office role after an in-person meeting that featured Suns owner Robert Sarver alongside Jones and, inexplicably, Arizona Cardinals wide receiver Larry Fitzgerald. Johnson, who came to the Suns in the Anderson deal with Miami, told his new teammates upon arrival about the rest of the league’s perception of the Suns. It wasn’t a good perception. Coming from a veteran team with organizational stability in Miami to a young team in Phoenix that needed experienced guidance, Johnson took on a more vocal role with his new team. 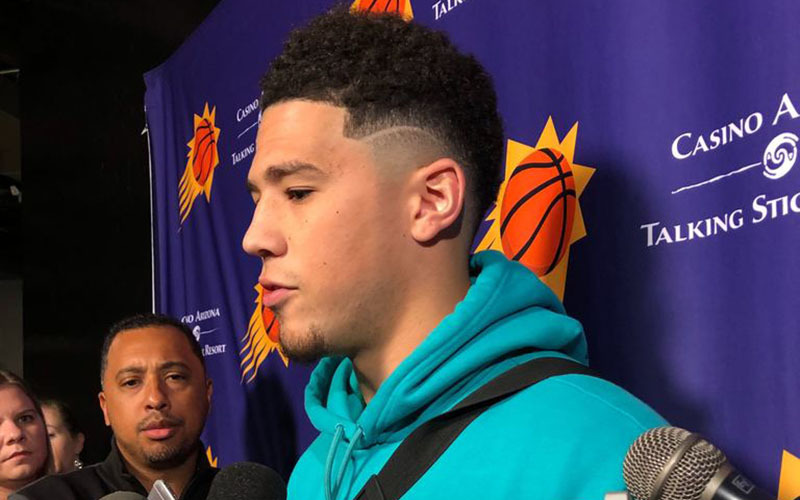 Much of the Suns’ future hopes are hinged upon the development of their young players, including Booker, Jackson and Ayton and Bridges. “One thing that’s obvious, and we can all agree on that, is the unbelievable potential and the talent that we have in that locker room,” Kokoskov said. 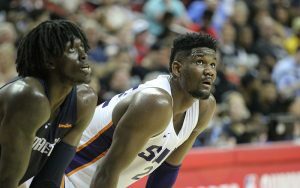 Ayton and Bridges in particular had strong rookie seasons, and proved to be valuable building blocks for the future. Ayton averaged 16.3 points and 10.3 rebounds per game while shooting 58.5 percent from the floor. Bridges appeared in all 82 games for the Suns — the only player to do so — and showed precocious versatility on defense. 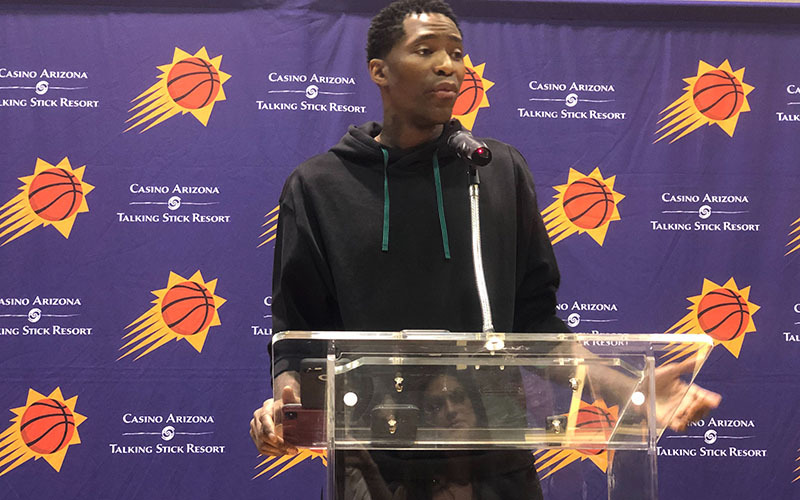 Jamal Crawford, the team’s 19-year veteran who finished the season with a flourish that included a 51-point outburst against the Mavericks, said he expects Ayton to be one of the faces of the NBA in the future. Ayton doesn’t lack for confidence. Aside from the few bright sports, the on-paper roster didn’t translate to on-court wins. Ayton expects that to change. Crawford, 39, was the one veteran who embraced his role and served as a stabilizing force for a young group in the locker room. Crawford shared with his teammates his own growing experiences in the league and, as he said during his exit news conference, learned a little about his own patience through the turbulence of a difficult season. But patience has not been a hallmark of the Suns in recent seasons. With the likelihood of another high lottery pick in the June NBA Draft and still no solid answer at point guard and they continue to search for an identity. As Johnson pointed out, in order to know what they need to fix and improve, the Suns need to understand exactly who they are now. “Anytime you can look in the mirror and actually be honest with yourself, I think that’s where growth happens,” Johnson said.